Dr. Poonam Khetrapal Singh has been appointed Regional Director for World Health Organization South-East Asia, for a second five-year term. 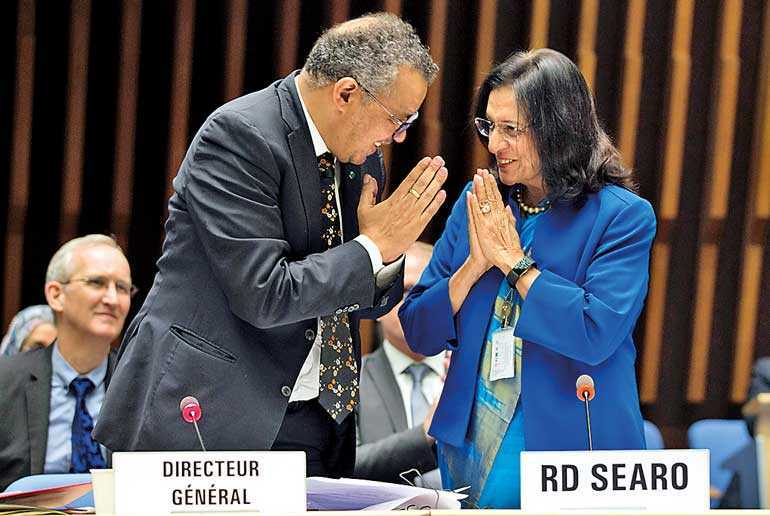 The WHO Executive Board on Sunday unanimously endorsed Dr. Khetrapal Singh, who was earlier also unanimously nominated by 11 member countries of the Region for another five years. Outlining her vision for the second term that begins on 1 February 2019, Dr. Khetrapal Singh, said sustaining the gains, accelerating progress to finish the unfinished agenda and innovating, would be the approach to ensure health and wellbeing of the 1.8 billion people across the Region. In her first term Dr. Khetrapal Singh, focused on building an increasingly responsive and accountable WHO in the Region, while prioritising persisting and emerging epidemiological and demographic challenges; promoting universal health coverage and building robust health systems; strengthening emergency risk management and articulating a strong regional voice in global health agenda. She identified eight flagship priority programmes, focusing on results and accountability, which are cascading into sustainable and result-oriented efforts. In the last five years, inclusive, sustainable and quantifiable gains have been made in the Region and are accelerating in pace every year. Certified polio-free in 2014, WHO South-East Asia became the second WHO Region to eliminate maternal and neonatal tetanus in 2015. Four countries eliminated measles and six controlled rubella. Maternal and under-five deaths reduced significantly. Thailand became the first in Asia-Pacific and the first with a large HIV epidemic – to eliminate mother-to-child transmission of HIV and syphilis. Maldives and Sri Lanka were certified malaria free. Maldives, Sri Lanka and Thailand eliminated lymphatic filariasis, India was declared yaws-free and Nepal trachoma-free. For universal health coverage, access to safe, high-quality medicine is being enhanced through the South-East Asia Regulatory Network established in 2016. Countries have developed multi-sectoral action plans for a whole-of-society approach to reverse non-communicable diseases. Prone to natural disasters, the Region’s investment in strengthening emergency risk management is evident from the responses to the Nepal earthquake, the Rohingya crisis in Bangladesh, cyclones, floods and earthquakes. There is a strong political commitment to end TB by 2030. Despite progress we have challenges; some permanent, some programmatic, some epidemiological and some transient, said Dr. Khetrapal Singh. Detailing her vision for her next term in her acceptance speech at the Executive Board, Dr. Khetrapal Singh said, “We must sustain the gains we made. It means ensuring we hold fast to our progress in diseases elimination, which history shows can return with a vengeance if attention falters, and ensuring that there is no room for complacency”. “We must accelerate sustainable progress,” she said. Her eight regional flagship priority programs are aligned to WHO’s global goals and health targets for Sustainable Development Goal 3. “We must innovate,” Dr. Khetrapal Singh said, adding innovation means taking advantage of the existing opportunities, being agile in applying research findings and developing new policies to meet the challenges we face. “Ending TB will be difficult unless we develop and apply rapid diagnostics, which test and diagnose large populations in a short time. Likewise, we cannot hope to eradicate key neglected tropical diseases which largely affect the poor unless we can create and implement policies that address the needs of specific communities in specific areas,” she said. The Regional Director said there is a robust commitment to leave no one behind. WHO’s ‘triple billion’ targets, the Sustainable Development Goal 3 and the efforts to achieve universal health coverage focus on equitable access and equity. “I have confidence that together we will sustain our gains, accelerate progress and harness the full power of innovation to advance health and well-being across the WHO South-East Asia Region,” Dr. Khetrapal Singh said.